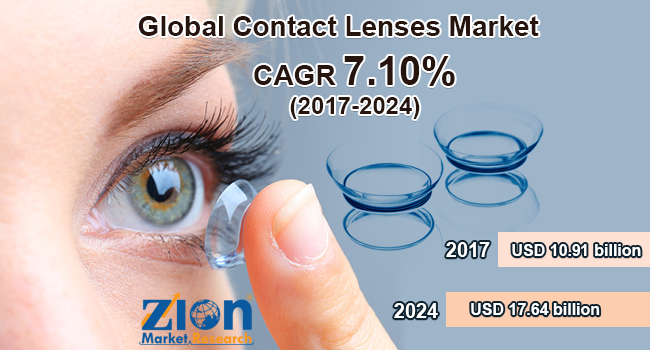 Zion Market Research has published a new report titled “Contact Lenses Market by Product (Soft Lenses, and Hard Lenses), by Design Type (Spherical, Toric, and Cylindrical), By Usage (Corrective, Therapeutic, Cosmetic, and Prosthetic), By Material (Hydrogel, Silicone Hydrogel, and Polymers), and Distribution Channel (Optical Stores, Independent Brand Showrooms, Online Stores, and General Retail Stores) - Global Industry Perspective, Comprehensive Analysis and Forecast, 2017 - 2024”. According to the report, global contact lenses market was valued at approximately USD 10.91 billion in 2017 and is expected to generate revenue of around USD 17.64 billion by the end of 2024, growing at a CAGR of around 7.10% between 2017 and 2024. Contact lenses are prescription lenses designed in such a way that they can correct the refractive errors of the eye and maintain the ocular health. They offer an improved vision and a clear peripheral image, unlike the corrective glasses. These are easy to wear and are considered as more comfortable as compared to the glasses. The benefit of using contact lenses is that they can be worn during any climatic conditions or outdoor activities. Aesthetics and cosmetics are the main factors for which people want to avoid wearing glasses and also to change their appearance. Contact lenses are very sensitive and are included among the safest form for vision correction when proper care is taken. By product, the contact lenses market is segmented into soft lenses and hard lenses. The soft lenses segment is expected to dominate the contact lenses market due to better vision & durability, and better oxygen permeability. On the basis of design type, the contact lenses market is segmented into spherical, toric, and cylindrical. The spherical segment is anticipated to dominate the contact lenses market in the forecast period. The usage segment is divided into corrective, therapeutic, cosmetic, and prosthetic. Corrective lenses segment is expected to dominate the market due to its high comfort and the increasing shift of population from spectacles to lenses for improved lifestyle and its high comfort. On the basis of material, the contact lenses market is segmented into the hydrogel, silicone hydrogel, and polymers. Silicone hydrogel segment is expected to dominate the contact lenses market in the forecast period. Visual acuity, simple to fit, and high initial and comfort, are expected to drive the growth of this segment. The distribution channel segment is further segmented into optical stores, independent brand stores, online stores, and general retail stores. Different services provided by optical stores are expected to drive the demand of optical stores segment. North America, Europe, Asia -Pacific, Latin America, and the Middle East & Africa are the regional segments of global contact lenses market. North America is anticipated to remain the leading region over the forecast period due to the increase in a population suffering from eye diseases and awareness about the eye health. Europe is expected to show a significant growth in the forecast period due to growing prevalence of various eye diseases. The Asia Pacific is expected to show high growth rate due to the rise in popularity of the contact lenses, the introduction of new products, and presence of branded retail outlets. Latin America and the Middle East & Africa are also expected to show a steady growth due to increased disposable income and rapid adaptation of western culture. The key players in the global contact lenses market are Johnson & Johnson Services Inc., Bausch & Lomb Incorporated, CooperVision Inc., CIBA Vision, Carl Zeiss AG, Valeant Pharmaceuticals, Novartis International AG, Abbott Medical Optics, Essilor International S.A., and SynergEyes Inc. The players, in the contact lenses market, are involved in the technological advancement of contact lenses to make them user-friendly.